I have long associated them with either complicated machines put together by studied hobbyists, or futuristic windowless military planes. However, drones, aka unmanned aerial systems (UASs) or vehicles (UAVs), have become ubiquitous in many disciplines. From film making and photography, to real estate and construction, to environmental monitoring and management, drones now serve as tools to solve diverse problems. 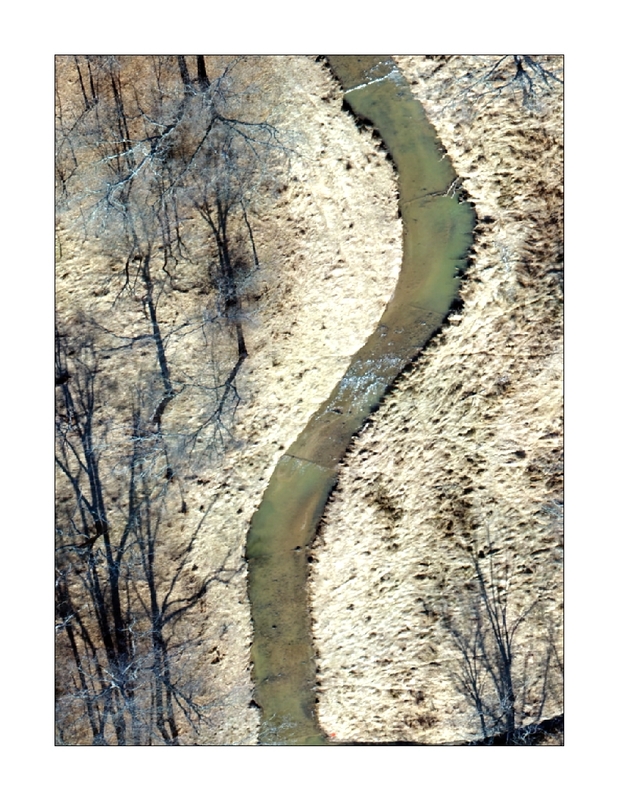 I use drones to understand changes in stream form due to management actions, and how those form changes may be related to changes in stream communities, like aquatic insects. We can use drones to capture overlapping imagery continuously across a relatively large area (on the order of 1–2 km). Using relatively recent advancements in computer software algorithms, we can stitch these images together to generate 3-dimensional models of the topography, much like stereoscopy. And unlike some other forms of remote sensing (e.g. Light-Detection and Ranging, “LiDAR”, scans), drone images can capture topography of shallow water (bathymetry), which allows us to capture continuous dynamics within the stream environment over larger scales than traditional on-the-ground surveying techniques. This development could allow us to see patterns of stream habitat over larger scales, and how those patterns of habitat may be affected by stream restoration efforts. I came to these studies with very little knowledge of drones. I was wary to try flying one, as it seemed like a great way to break something expensive within the first few months of being a part of my new advisor’s lab. However, drone flying is not what it used to be, and not what I thought it would be. Advanced technologies have allowed unmanned aerial vehicles to become much more user-friendly. As with any other good backup plans, these features shouldn’t be solely relied on, but they sure relieve anxiety when you’re still learning how to control these small but powerful pieces of equipment. In studying for my Federal Aviation Administration Part 107 certification exam, I learned a lot about aeronautical operations. As with other types of piloting, preparation is key. For the purposes of my research, the drone is in the air for a relatively short period of time, and the preparation prior to flying is the most time intensive and crucial part. Properly preparing prior to the flight includes taking precise location data of points you will be able to see from the air so that you can properly align the imagery in a 3D model that will match “reality” as closely as possible. Similarly, I take a discharge measurement, (a measure of the volume of water flowing through the river at a given location and time) before flying to use in identifying continuous flow patterns in the stream. A final piece of preparation is to identify places where the drone cannot be flown or where flying requires permission, and places where communication with others using the airspace is key. This picture shows me at one of my study sites discussing with my collaborators that I contacted the nearby airport prior to flying. Drones have become an indispensable tool for researchers in diverse disciplines. In geographic surveying, the relatively cheap and user-friendly technology provides us with an efficient and flexible alternative to more expensive and time-consuming methods to gather topographic data and remotely sensed imagery. Commonly used alternatives for aerial imagery come from satellites or manned aircrafts, and alternatives for topographic data come from LiDAR scans of varying spatial scales, or ground surveying at relatively limited spatial scales. Drone surveying allows the user flexibility to collect the data at relatively large scales (in comparison to ground surveys), while also choosing when the data is collected, and even taking repeat surveys in quick succession, (something that is not possible with satellite data or other governmental sources, or would be very expensive to fund on your own). Using drones lets us better control our surveying efforts, which is crucial in designing scientific studies. While I never anticipated needing to know how to fly a drone, I’m glad I was able to gain this powerful skill in graduate school to bolster my current and future research. Hayley is pursuing a Master of Science in the Geography and Environmental Systems Department at the University of Maryland, Baltimore County. She is working with her advisor, Dr. Matthew Baker, to study physical habitat dynamics in restored streams using drone-based imagery.